After a quick check of some of the sites near the house at Baltasound, we decided to head back to Norwick to look for the pipit Martin had flushed yesterday. We'd only been on site for a few minutes when Martin found two Little Buntings feeding together near the road. They were quite tame and didn't seem to mind us being around them. 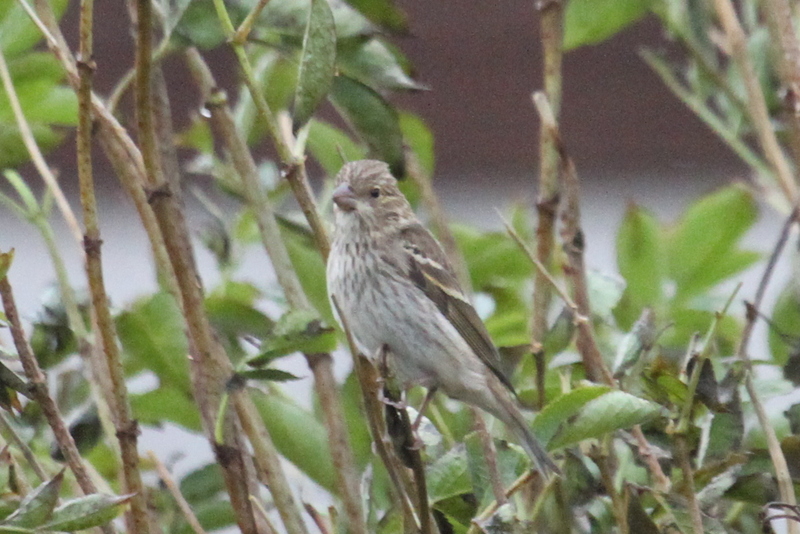 There may have been up to 4 Little Buntings at Norwick. One flew across into the sheep fields whilst Martin was still watching two birds and Geoff found another in the dunes (which might have been the one that flew initially to the sheep fields). Anyway, it was really cool to see two feeding together. We couldn't find yesterday's pipit, or the OBP, but we did notice a bit of an influx of Blackcaps, Goldcrest and thrushes and Yellow-browed Warbler and 3 Long-tailed Ducks were nice to see. After lunch we headed out to Burrafirth and Hermaness. A Yellow-browed Warbler and a Siskin showed nicely around the burn and a ring-tailed harrier flew over the visitors centre. We finished the day off back at Baltasound. The best bird found as the light was fading, was another Olive-backed Pipit! It was quite a way from where we found the one on Saturday, so perhaps a new bird. Tomorrow is due to be still and sunny, so we're hopeful of finding a good warbler or something that finally has a chance to feed. We'll see! A quiet start to the day. I walked along to Burness and continued around the coast to check out a few crofts and then up past the Baltasound Hotel, but migrants were very thin on the ground. After an early lunch we headed over to Skaw and Norwick where we spent most of the remainder of the day. There were lots more birds here; a few Robins, Blackcaps, Whinchat, Wheatears, 2 Siberian Chiffchaffs, 4 Yellow-browed Warblers and 3 Tree Pipits. Martin flushed a pipit from the gully at Valyie that called like a Pechora but after walking up and down the field that Martin thought it had landed in, we had to give up. 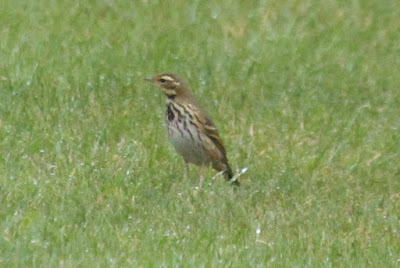 Our search did kick up the Little Bunting that had been resident at Norwick for a few days, but the best bird (again!) 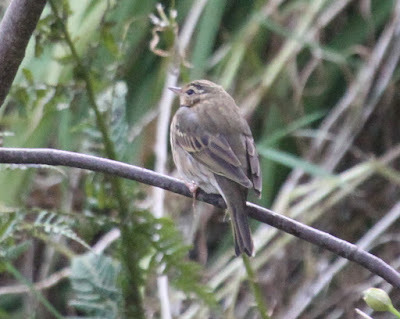 for the day was Olive-backed Pipit. 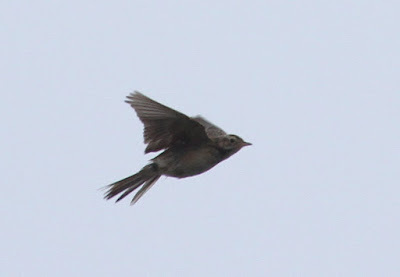 As we were searching for the possible Pechora, a pipit came in high, calling "tseeet" and flew around above us. It had obvious bold black and white markings underneath and then headed north over the sheep fields. We headed back over to Valyie and although we didn't find Pechora, we did find an Olive-backed Pipit, perhaps the same bird that had just flown over us minutes earlier. The bird remained fairly faithful to the gully area but ventured all the way from the very top to the most lower sycamore trees. The best day by far as yet! 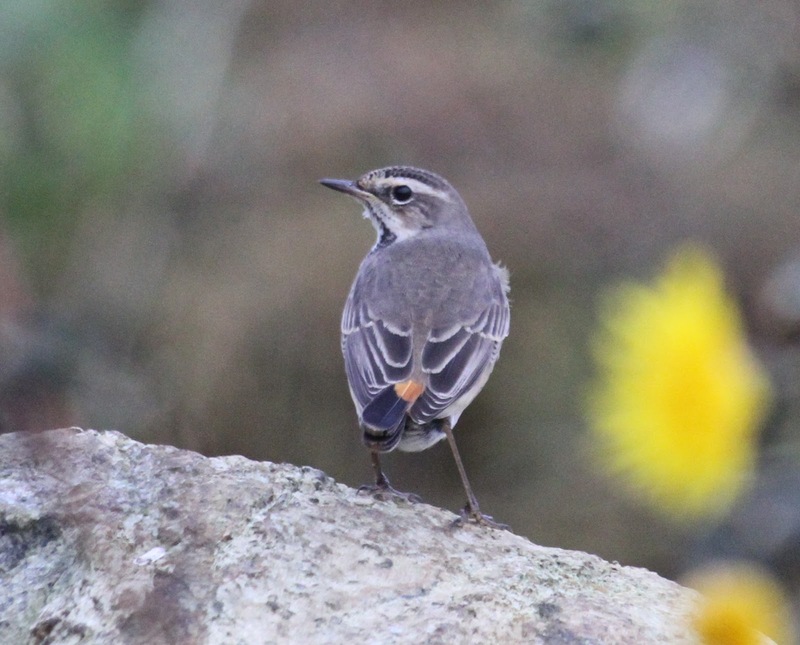 The overnight SE wind and rain grounded a number of migrants, with pipits being the most obvious arrivals. A fly-by Osprey during breakfast was a nice start to the day, but the best bird I had today was also one of the first ones. I headed down to the weedy fields near the Post Office and not long after I'd been there I heard a buzzy pipit-like call. 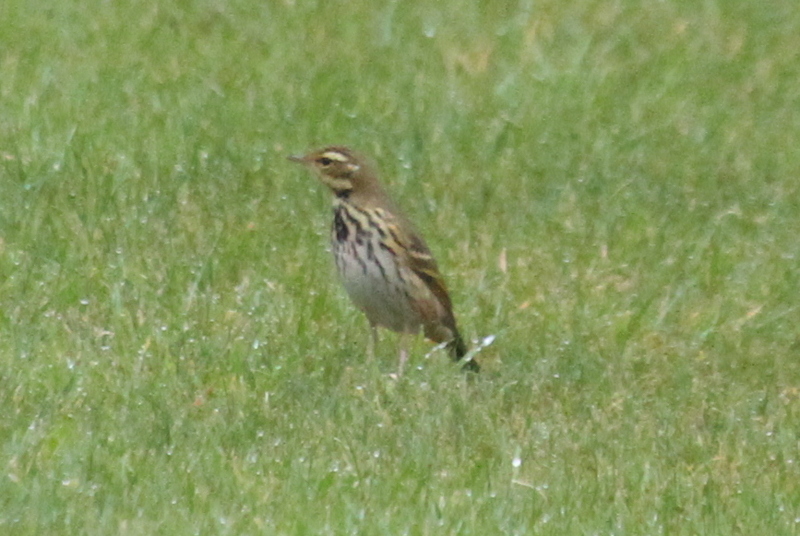 I waited around for 10 minutes examining the field but then the bird flew out calling again and headed over to the walled garden on Springpark Rd. 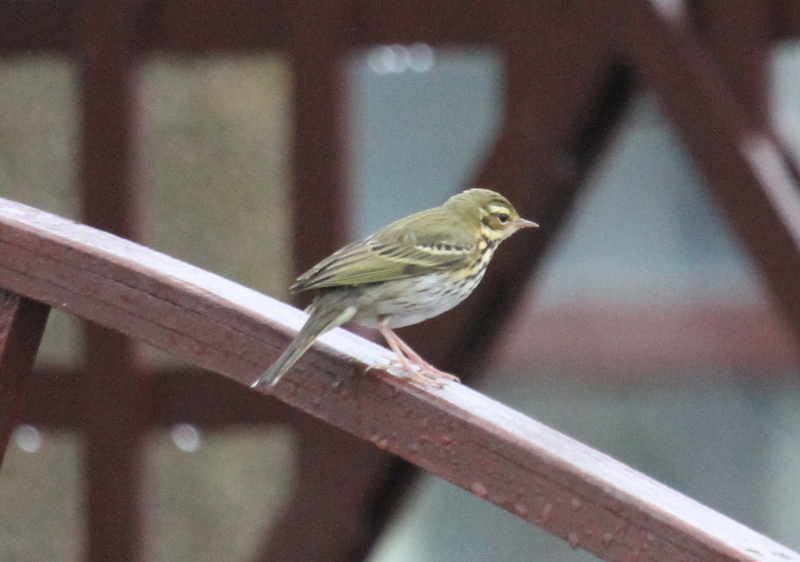 I got a really good view of it in flight and was convinced it was an Olive-backed Pipit. I headed back to the house to let Martin and Geoff know about the bird and then went to the walled garden where the bird immediately flew into a sycamore opposite and gave really good views, confirming its identification. Over the next 30 minutes the bird flew back to the weedy fields and then back to the gardens on Springpark Rd where I grabbed some photos of it. We also had a Richard's Pipit behind the store when we were trying to relocate the OBP which we got pretty good views of later. 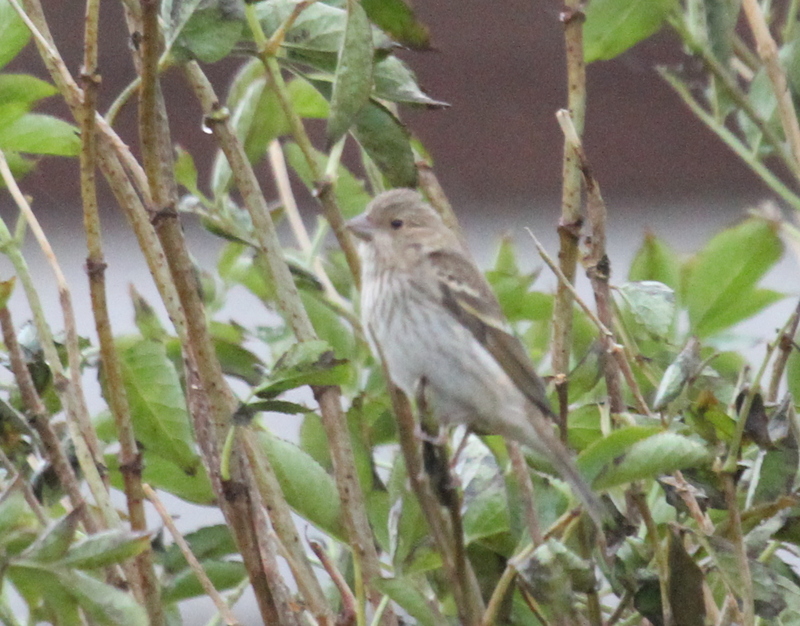 The Common Rosefinch was also around the weedy fields briefly and posed for some photos. Pink-footed Geese were also on the move today and a fly-over flock of 36 Snow Buntings was nice. After lunch we headed around the more inland sites around Baltasound, mostly around the school and cemetery. There were some nice migrants around including Great Grey Shrike, Siberian Chiffchaff, 2 Yellow-browed Warblers, Garden Warbler, Willow Warbler and lots of Redwing and a few Fieldfare. It was then off to Haroldswick where we spent the rest of the afternoon. The best bird there was a Bluethroat feeding along the north edge of the bay, a Richard's Pipit by the farm and a Yellow-browed Warbler by the pond on the approach road. Great ending to a really nice days birding! Last night's clear skies resulted in a big clear out of birds. A Yellow-browed Warbler around the Post Office in Baltasound was about the only decent migrant of the day. 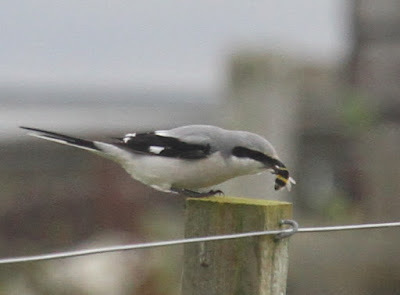 The Great Grey Shrike remained around the Baltasound Hotel, but birding was really hard work with a combination of a lack of birds and quite strong winds. 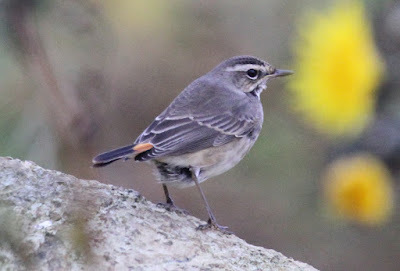 We tried the west of Unst in the afternoon, birding around Lund, Westing and Ayesound. Snow Bunting and Whooper Swan were the only notable birds. Although the day started off wet and windy, it cleared up by late morning and resulted in a lovely sunny, still afternoon. The best bird of the morning was a Great Grey Shrike around the house plus 3 Yellow-browed Warblers in Halligarth where Martin also found a Richard's Pipit. One of the Little Buntings remained in the deserted crofts behind the house. We spent the afternoon around Norwick which was full of Goldcrests and Blackcaps. Lots of thrushes in that area, which included 3 Ring Ouzels. 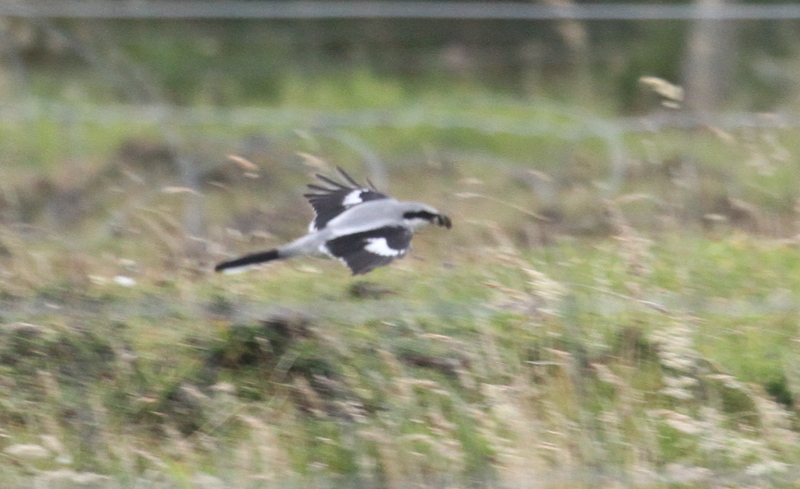 We finished the day on the road between Haroldswick and Burrafirth where Marsh Harrier was quite a surprise to find. Also Richard's Pipit, Whinchat and Stonechat were nice to see. A very clear night with great views of the Northern Lights, Aurora borialis. The wind and rain was horrendous today and meant that we only really ventured out from the house during the occasional 'lull'. We still got soaked, but at least it took a bit longer to get soaked. Geoff Wyatt found a Common Rosefinch in the weedy field by the post office first thing and then we found two Little Buntings in the field behind the house (on Springpark Rd.). I saw one of the birds on the deck a few times and the other bird flew up calling from near where we flushed the first bird, so I'm presuming both birds were Little Buntings, although none of us got a great view of the second bird before it flew west to house on the west side of the A968. One of the birds was still in the same place in the afternoon before it flew east to the deserted crofts. The wind and rain should be stopping by lunch time tomorrow, so we're hoping for good things! I suppose my lack of entries has sort of echoed my lack of field activity over the past few months. I've been doing a bit of birding in East Norfolk, but nothing to rave about. Anyway, I've got two weeks on Shetland now, so lets hope I've got plenty to blog about. I drove up to Aberdeen yesterday (10 hour journey, most of it in the rain) and got the overnight ferry to Lerwick. Bus, ferry, bus, ferry, bus and here I in Baltasound, Unst where I'll be for my trip, staying with Geoff Wyatt and Martin Hallam. The wind was howling today; 50+ mph winds make birding difficult! Yellow-browed Warbler in the garden was nice though as were the small smattering of migrants that we saw at Norwick. 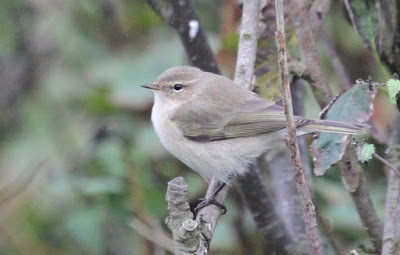 Plenty of Goldcrests and Blackcaps with a few Robins and Brambling were what we could pin down in the strong winds. Tomorrow is supposed to be very strong south-easterly winds with heavy rain, so I don't fancy our chances of finding much in that, but the weather is supposed to be clearing up on Thursday, so lets hope this weather brings lots of stuff in with it and that the island is hopping with rares in a couple of days time. After a meeting in Newcastle on Thursday, 16 'Great Aukers' headed up to Seahouses on Friday and headed out to Staple Island to witness the spectacle of seabirds on the Farne Islands. After the first trip (and a great Fish & Chips lunch) I headed out to Inner Farne to photograph terns (absent from Staple Island). Staple Island is great for auks, with thousands of breeding Puffins, Common Guillemots and Razorbills. We started by doing a tour from the boat of the seabird cliffs and rocks, where we saw lots of auks and Grey Seals. We then headed over to Staple Island where we spent an hour admiring the various birds it had to offer. Puffins were the most photogenic and were the species that I spent most time photographing. I always say that you can eat too much food and drink too much wine, but you can never take too many Puffin photos! Here's a selection of my best photos (click on the photos to view them full-size). After the Puffins I spent a bit of time photographing Common Guillemots and the Great Auk's closest extant relative, Razorbill. Here are some photos that I took on the island and also from the boat. The first photograph below is of a 'Bridled' Guillemot, named after the white eye-ring and stripe behind the eye. The Bridled form of Guillemot increase in frequency the further north you go, but on the Farnes they make up about 5% of the birds. Rock Pipit, one of the few breeding passerines on The Farnes. From the boat we were witness to one of the many perils newly fledged Guillemot chicks face. This Great Black-backed Gull was tucking into a guillemot chick that it had presumably recently killed. Finally, on the way back to land we spotted some Bottle-nosed Dolphins feeding in the bay in front of Bamburgh Castle, so headed straight over to see them. The dolphins put on a really nice show, swimming and 'porpoising' around the boat. The first photos below show the dolphins with Bamburgh Castle in the background. After we landed back at Seahouses it was off for a quick lunch of fish and chips, say "Bon voyage" to my brilliant host Matt Ridley and the fantastic host of scientists that I'd had the pleasure to spend the past 24 hours with and then off back to the quay for my second trip of the afternoon, this time to Inner Farne. By chance, Chris Redfern (editor of Ringing and Migration, who had been at the previous day's meeting, but not on the Staple Island boat) was heading over to Inner Farne to do some ringing, so it was really nice to have a good chat to him on the way across. Inner Farne is famous for it's large colonies of Arctic, Common and Sandwich Terns. A hat is a must for this island as the terns can be quite aggressive in defending their nest sites, some of which are actually located on the boardwalk across the island. The first thing I did was to check the rocks next to the landing quay to see if there were any Roseate Terns roosting there. Roseate Terns don't nest on the Farnes, but failed breeders from Coquet Island to the south often spend time on the Farnes. My endeavour was rewarded with a lovely 'rosy' Tern sat on the rocks with the Arctic Terns. I then headed up onto the main part of the island where I spent about half an hour photographing the terns breeding around the visitors centre (in between ducking out of the way of overly-aggressive terns). Here's the best of those photos. The centre of Inner Farne also has a colony of Sandwich Terns, which were busy coming and going with sandeels. Finally, the island also has a good population of various other species such as Common Eider, Eurasian Shag and Kittiwake. Here's the photos of these 'best of the rest'. Kittywake enjoying the updrafts on the seabird cliffs. So, another great visit up to the Farne Islands providing some great company with some great birds. Northumberland is a lovely part of the country and if you've never been, you're definitely missing out!